Artesian Spas will be tuning into promotion of new Bluetooth sound system capabilities at The Pool & Spa Show this week and targeting retailers searching for a complete range of hot tub and swim spas from a single supplier. Fresh from the brand’s exposure as an exhibitor at the UK Pool & Spa Expo at the NEC in Birmingham to promote the Platinum Elite, Island Spas, South Seas Spas and Garden Spas, plus the TidalFit swim spa ranges, the Nevada-based manufacturer is now turning its attention to its ‘home turf territory’. Artesian Spas will be welcoming visitors to their stand at the The Pool & Spa Show, organised by the Northeast Spa and Pool Association in the Atlantic City Convention Centre, in its latest high-profile exhibition event to boost its retailer network. Members of the Artesian Spas exhibition team are taking advantage of the three-day wet leisure showcase to highlight the latest Bluetooth Sound System enhancement from the multiple WhatSpa? and WhatSwimSpa? Best Buy Award-winning production line of May Manufacturing. 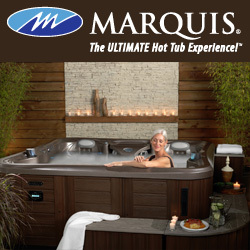 Having been fully integrated into the topside control panel of the 2015 Island Spas and Platinum Elite models, the Bluetooth Sound System’s waterproof topside control provides user-friendly music streaming capability, while using the hot tub and also connects wirelessly to smart phones and tablet devices. Three new TidalFit models have been launched for 2015 to enhance retailer’s capabilities to meet the growing demand from the swim spa market, including the Active EP-12. It comes in at 366 x 231 x 114cm with dual swim jets and 14 hydrotherapy jets and was the main focal point of the Artesian Spas stand during the UK Pool Spa Expo last week, which organisers revealed will run from February 18 to 20 in Halls 7 and 8 at the NEC next year. An Active Plus EP-12, which comes in at 366 x 231 x 132cm; and a PowerPlus EP-16, which comes in at 487 x 231 x 152cm; have been produced to boost the TidalFit stable that includes the WhatSwimSpa? Best Buy Award-winning EP-14 model. This year’s advanced Bluetooth Sound System, being included in the Island Spas and Platinum Elite range, is fully integrated into the topside control panel of all the three new TidalFit models for user-friendly use, while WiFi App Control is available via iPhone or Android devices. Water purification options include the Crystal ProPure System and Crystal AOP ProPure Advanced Oxidation System. Thanks to the innovative DirectFlow Switchless Motor and Direct Plumbing System technology, combined with the Variable Flow Control (VFC) users can enjoy individually controlled hydrotherapy massage following a strenuous workout session in the TidalFit models. Aquatic Training System provisions within the trio of TidalFit models include Rowing Bars, Strength Training Resistance Cords, Clips and Handles; plus the Aqua Treadmill Stationary Resistant Swim Tether. Artesian Spas have also introduced a new version of the WhatSpa? Best Buy Award-winning four-seater South Seas 518P model, pictured, which comes in at 198 x 152 x 76cm. It has been specifically designed with Spa Frog in-line sanitation capability for hot tub retailers aiming to exploit the growing demand from holiday lets and lodge parks. “This model has been introduced for 2015 with Spa Frog sanitisation to help our dealers to target holiday park and lodge customers in the future,” said Artesian Spas Director Simon Wrigglesworth. Artesian Spas will be on Stand 2845 during The Pool & Spa Show at the Atlantic City Convention Centre. Opening times for visitors will be from 11am to 5pm on January 27 and 28. On the final day, January 29, the Exhibition Hall will be open to visitors from 10am to 2pm. The Education Conference, running today until 5pm at the host venue, will continue on Wednesday from 8:30am to 11:45am, while the final day’s Education Conference, on January 29, is running from 10am to 2pm. Filed Under: Event news, Events & expos, New products, News, News & views, Products Tagged With: Artesian Spas, hot tub retailers, The Pool & Spa Show, TidalFit, UK Pool & Spa Expo, WhatSpa?, WhatSwimSpa?